Sweden, 1969, 115 minutes, Colour. 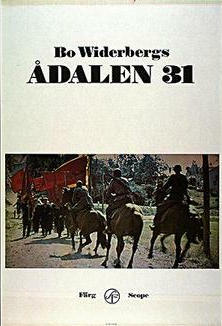 Adalen 31 is Widerberg's next film after Elvira Madigan. In Elvira Madigan he used a pastel beauty of nature to blend with music and lyrical feeling in his actors to convey a story that was beautiful, evil and tragic. He also recreated an atmosphere of the late 19th century. Widerberg is even more successful in using exactly the same techniques to present a story of industrial unrest and protest. Rural Sweden in 1931 comes to life very sensitively as we are shown (again a pastel beauty of nature, this time on the wide screen) the details of the life of an ordinary town family affected by the strike. Lyrical feeling and the conveying of mood and emotion by small incidents and almost insignificant detail show us characters who are alive. In building up his situation slowly, the shattering impact of the soldiers firing on the villagers processing in protest is frightening and makes us share in the total surprise of the people that this should happen. This is a film of social comment which scarcely includes a line of sermonising or propaganda. Rather by ingeniously making us share in the life of Adalen, we respond to the social message of industrial action and strikes. This film will not have very wide circulation, but it should be seen if possible. 1. How did the film build up its atmosphere? HOW did it communicate its mood? Comment on the detailed presentation of small day-to- day incidents of family life. 2. Give your impressions of Swedish life in Adalen in 1931. 3. Why were the men on strike? What was being done to end the strike? 4. What kind of character was Harald? Comment on the main incidents which reveal him. 5. Comment on the scenes of the children playing at flying. the adolescents and their band and their sexual curiosity. 6. Why did the strikers protest against the scabs? Did the young 'scab' helped by Harald make any case that justified them taking the work? 7. Was the procession of the people a lawful protest? Why did the soldiers open fire? Did they have any justification? 8. What was your reaction to the shooting? Did it draw a strong emotional response? 9. Critics consider this film a masterpiece -they point to the acting, the simple but humanly appealing detail, the beauty and colour of the village, the gradual build-up to the surprising and shattering sequence of the shooting. Do you agree?